Windows 10 insider build 14951 is now available for fast ring insider members. Whereas, mobile users are facing download issue with the latest build. Meanwhile, Windows insider team is now testing PC build 14954 and mobile build 10.0.14954.1000. The build is compiled on October 19, 2016. 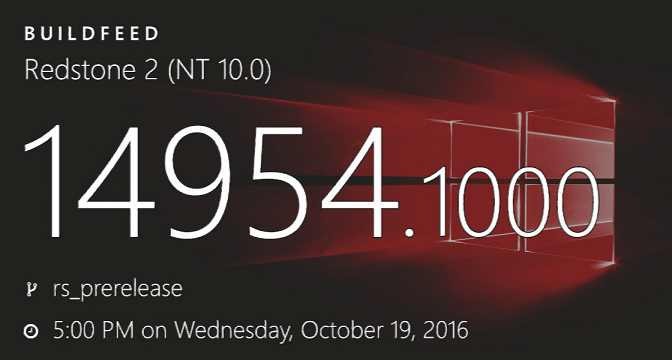 Microsoft is also testing cumulative update Build 14393.351(Redstone), build 10586.639(Threshold 2), and build 10240.17157(Threshold) for Windows 10 users. Windows 10 preview build 14931 is also now available for Slow ring insiders. You can download ISO from here.